I admit it. I don’t really care about months. When a new one comes round, nothing changes in my life. So, why is the ‘month view’ so prevelant in calendar apps? 3-4 weeks into the future and maybe 1 week into the past. This way I can see what is coming up, and a bit of what just happened. The month view totally breaks down when you are at the border of a month. Keep Marketing out of everything? I am a fan of Kathy Sierra, but I have to say that I am not sure about having marketing make the user manuals. I am more like Darren and keep them away!. I think what Kathy is really looking for is: Let’s not do a half arsed job on user manuals. It isn’t about the glossy, it is about giving value. These days you can buy a rocket system and you will just get a one pager that is barely readable. It will talk about part X, and you will not be able to find it. So, if we do care about our ‘passionate users’ let’s help them get their work done (like kathy says) solid manuals (not written by marketing people) are good. Paul Hammant has just spoken up on ‘Did you send this’ – another weapon against spam?. This is much needed (as are other ideas like this). I just got hit by this recently. A set of penny-stock spammers started to use the domain for a company that does stock analysis. Obviously it makes sense to them. The real company IS to do with stocks, and DOES send out newsletters and updates to its users. As such, they can piggy back on a valid domain that can get through some spam firewalls. There is nothing that we can do. Anyone can set From: to whatever they want, and we just sit here watching the millions of bounced emails come to us. We need reverse DNS for email, so From: addresses can be verified. Google Wireless Transcoder: How have I not seen this before? So many sites look like utter crud on my Blackberry. 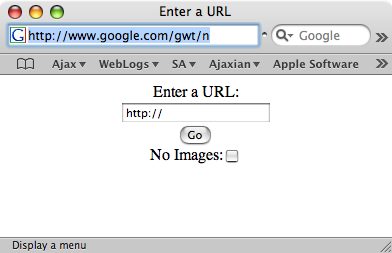 How have I not seen the Google Wireless Transcoder, which can take a site and strip it down to hopefully be readable. It isn’t perfect, as people can do a lot of bad HTML coding, but it does a much better job than my Blackberry does itself for many sites out there. 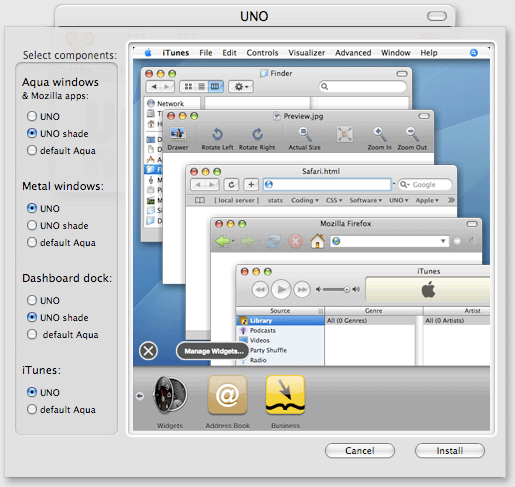 The OS X team seems to be moving away from 3d-ish stuff in Leopard and iApps. Why wait for Leopard when you can use a simple utility called UNO to unify your look and feel (and tweak it for various components). I would imagine it would be a great feeling if the project you worked on at Google made it to the select list of apps that show up on the google.com page (currently: Images, Video, News, Maps). Froogle got kicked off of this list, to give way to Video (yay YouTube?). I hadn’t realised that if you click on more you get a small inline div popup showing you books, froogle, and groups. I know google likes to keep things minimal, but do we really need these steps? Couldn’t you fit those three projects in on the page somewhere? Would it be SO bad to Effect.Appear a nicer grouping when I first ask for more? How about letting me change this grouping at /ig ? Or watching what I happen to use and changing it to reflect my preferences? It looks like Java is getting closures. After years of the .NET folklaughing at us as they compare delegates to futzing with anonymous inner classes, and the guys with true closures (ruby, lisp, …) laughing at the poor static folk who don’t have them, the Java platform finally can. Having “^ expression;” to mean ‘return out of a closure’ to stop some of the madness of “does return get out of X or Y?” is interesting. I hope that Dolphin ends up with something great here, and not the mess we have with generics and type erasure. Ricky Gervais and Stephen Merchant of ‘The Office’ and more put together two videos for Microsoft training. I am finding it kinda funny to see all of the websites that have “Digg this!” links or buttons on every page. 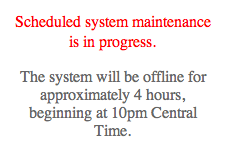 The problem is that I keep seeing this on sites that are never going to benefit from this. How many people do you REALLY think will Digg anything on your website that talks about pork belly prices? Digg works great if you are talking about Apple/Microsoft/Mobile Phones/Web 2.0 and of course Digg itself. But if you are not in the 12-18yr old demo, leave off the digg buttons.